Curatorial introduction to her exhibition at Arter, Istanbul - a survey of the last two decades of her art production, including new works created for Istanbul. "You Are Still Here" is a comprehensive survey of Mona Hatoum’s work that focuses on the last two decades of a diverse production through which the artist has determinedly explored a sense of the malaise and unsettledness that permeates our contemporary world where even the most familiar can no longer be considered safe. The exhibition aims at making meaningful quotations to allow a viewing experience that unfolds the larger framework of the social and political contexts in her work. Hatoum’s oeuvre is dedicated to a persistent investigation of a broad range of issues related to home and displacement, closeness and distance, loss and separation, surveillance and regimentation by institutional power structures, the endangered and violated human body—or the body "as a metaphor for the social forces acting on it". Mona Hatoum’s work is an unrelenting exploration of the contradictions and complexities fostered by the state of the world today. By following strategies of unexpected juxtapositions of several formal and visual elements, she creates paradoxical layers of meaning  and tackles dichotomies in her works that are always finely tuned to generate implications rather than rigid statements. Her clever manipulation of materials and scale prompt a multitude of associative references, providing certain flexibility in the cognitive and sensory experience of each viewer. The exhibition at Arter borrows its title from one of Mona Hatoum’s works, You Are Still Here, which dates back to 1994 and was translated in a second version into Arabic in 2006. In both versions, the same sentence is sandblasted on the surface of a portrait format wall mirror. What appears in the mirror when the viewer faces the work is a momentary representation of the self: the viewer’s actual presence is doubled with his/her reflection in the mirror and both sides of this divided self are set in conversation. As described by the artist, the content of this conversation is all about a confirmation of existence and survival. The positioning of the individual in this conversation or the personal implications this statement might stimulate, will certainly vary according to each viewer’s own subjective experience. Yet in essence, this reassuring self-affirmation strongly implies a testimony to and a celebration of survival against the odds in the face of unpredictability and potential danger. The exhibition opens with one of Hatoum’s recent works, Bunker (2011), an installation with six architectural steel structures selected from a larger set of twenty two that can be shown in various numbers and configurations. Installed on the ground floor of Arter and visually accessible from the street, the work transposes an unfamiliar cityscape into the gallery space. Constructed of rectangular steel tubes stacked horizontally, these structures look like scaled-down models of certain buildings stripped of all architectural detail down to their basic elements. Seen from a distance, these heavy modules resemble architectural models of a future project in development, but as you approach and walk amongst them, they reveal marks of destruction on their pristine, shiny surfaces. Even though quite abstracted and reduced to simple architectural volumes with gridded patterns on their façades, each module in this cityscape resonates with signs of war and destruction. 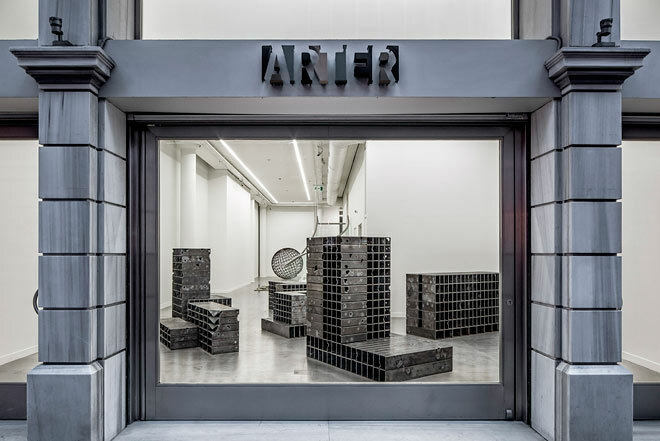 Hatoum has created a number of new works specifically for the exhibition at Arter. One of these works is a carpet on which she maps the whole world as a danger zone by drawing yellow circles of seismic waves all over its surface and dividing it into slightly shifted segments. The carpet entitled Shift (2012), echoes an alarming danger of epic proportion or a global catastrophic risk that resonates through the entire world rather than a specific location. Reminiscent of seismic movements, the whole map is fractured and its topographical integrity destroyed. Alongside its associations with the globally threatening environmental challenges of our day, the work depicts the whole world as a shooting target that could be aimed at and destroyed at any moment. Kapan (2012) , Hatoum’s latest work, conceived specifically for the exhibition at Arter and produced in Istanbul, denotes both her unfettered interest in issues related to the body and her fascination in bringing together diverse materials of opposing natures. The work consists of five modules made of steel, each slightly different in size, yet all scaled to average human height. Vertically installed, their upright positions slightly tilted as if unstable, these modules are made of steel reinforcing rods that are commonly found on building sites and around unfinished construction sites. However, rather than being structures of reinforcement, these objects operate more as uncanny structures of entrapment. Their rigid mesh patterning tightly encapsulate fragile and amorphous red glass objects; it is as if some strange creatures or unspecific body parts are trapped inside of a bodily shell, trying in vain to break out. Combining a solid geometry with imprecise forms, and solidity with fragility, almost welded into each other, the work subtly resonates the vulnerability of the human body—threatened, captured and controlled by power structures—as well as one’s own sense of inner exile. After attending one of her exhibitions, the late Palestinian scholar Edward Saïd summed up Hatoum’s work saying: "a lot of sentiment but no sentimentality". This delicate, yet often hard to achieve balance has always been secured in Hatoum’s work through methods and strategies that sensitise the viewer on physical and mental levels without using clear narratives. Inspired in part by a personal history, the topography of Hatoum’s work, which has been shaped over almost three decades, has always maintained its own idiosyncrasy rather than referring to any specific geography or history. The territory covered by her work remains simultaneously foreign and familiar to all, with ever shifting borders starting from skin, expanding to that of home, trancending political ones. Guy Brett, Itinerary, in Mona Hatoum (London: Phaidon, 1997), p. 43. Janine Antoni, Interview: Mona Hatoum, BOMB magazine, (New York; Spring 1998; issue no. 63), pp. 54-61. Kapan means trap in Turkish. Curator, Exhibitions Director of Arter - Space for Art, Istanbul, Turkey. The text is a shortened version of Emre Baykal's essay published in the exhibition catalogue. Courtesy of Arter - Space for Art.